Food blogger Nikki Rappaport cooks Joey Fatone a few unique and delicious breakfast dishes that have been part of her family for years. These easy recipes will make any brunch gathering special. The 27-year-old's food blog is called Cupcakes for Breakfast. Since she is a morning person and loves to cook, her blog is dedicated to morning delights and sweet treats. "I'm a 27-year-old food blogger and I am all about eating cupcakes for breakfast!" said Nikki. "Cupcakes for Breakfast is the name of my blog. It is a nod to the fact that I am a morning person and I love breakfast and I love cooking in the morning but I also love sweets so I kind of mash the two together." Nikki is very familiar with Joey's former band, 'N Sync. As a 12-year-old girl she collected all the albums and she met Joey when he was on Broadway in Rent years ago. "I am a huge N'Sync fan. Words don't even describe how excited I am to meet Joey today. To cook with him, to hang out, to share my recipes, I think it is going to be a blast!" said Nikki. As soon as Joey arrives, Nikki greets him with some 'N Sync posters and a cupcake! Cupcakes aren't what Joey usually eats but he is more than happy to start things off with a sweet dessert. Then, they get started on Grandma Rita's Jewish coffee cake. It is a staple at Nikki's family breakfast table. Even though Grandma Rita isn't Jewish, she believes this recipe has a special ingredient which makes it Jewish. "My mom's side is Italian and my dad's side is Jewish. Grandma Rita comes from the Italian side and she has been making this recipe for her whole life for my mom and my mom's brothers and sisters growing up. She always called it Jewish coffee cake solely for the reason that it had sour cream in it," said Nikki. A traditional coffee cake has all the crumb on top but Nikki's grandma likes to put the topping inside the cake so you can enjoy the flavors and get a piece of the crumble with every single bite. Next, they make a dish that brings back memories for Nikki growing up in the Garden State -- Jersey summer corn and blueberry waffles. "They are a tribute to my summers back home in New Jersey. I love those two flavors. They remind me of the fresh food that's grown there and the bright flavors of summer," said Nikki. Even though corn isn't traditionally used in waffles, Nikki thinks it gives the breakfast treat a wonderful flavor and texture. She uses regular corn and creamed corn to make the batter. When the waffles are warm and crispy, she tops them with a homemade blueberry sauce. After enjoying the tasty waffles, Nikki whipped up her famous 'get sloshed slush mimosas.' This cocktail is Nikki's take on a breakfast mimosa. She freezes a combination of whiskey, pineapple juice, cherries and ginger ale. Then, she puts a frozen scoop of the mixture in a glass and tops it with procesco. It's very refreshing and perfect for a summer brunch! Nikki's brothers joined her in the kitchen to help her make the final dish -- breakfast pizza. Pizza for breakfast isn't a typical choice for most people but Nikki turns this dish into one for the early riser with her Pinciotti antipasti breakfast pizza recipe. "So we'll do a lot of different things when we have people over, a lot of different types of recipes. But one thing we will always have is an antipasti platter  prosciutto, salami, roasted red peppers, tomatoes, artichokes, basically the whole the shebang," said Nikki's brother. Nikki uses the leftover antipasti to make this pizza the morning after a family gathering. She tops puff pastry dough with the antipasti, cheese and an egg. The result was a delicious mix of flavors on a light and flaky crust. This coffee cake has layers of a crunchy crumb mixture inside the cake so you can enjoy the flavors with every single bite. Even though corn isn't traditionally used in waffles, it gives this breakfast treat a wonderful flavor and texture. This cocktail is very refreshing and perfect for a summer brunch! This breakfast pizza is made with puff pastry dough and topped with antipasti, cheese and an egg. The result is a delicious mix of flavors on a light and flaky crust. 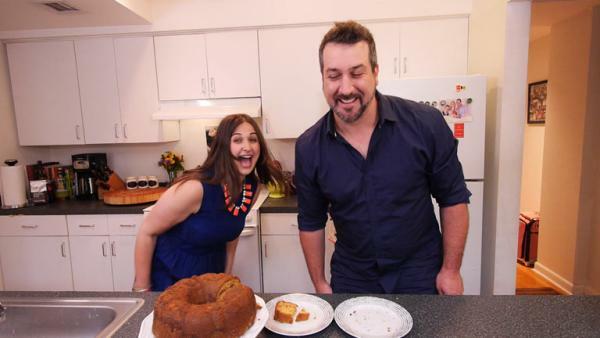 Go behind the scenes as Joey Fatone gets in the kitchen with one of his biggest fans.